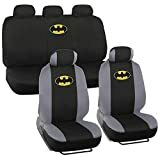 If you are looking for superhero car seats and accessories, then Batman (one of the most popular superheros) seat covers should be at the top of your list. 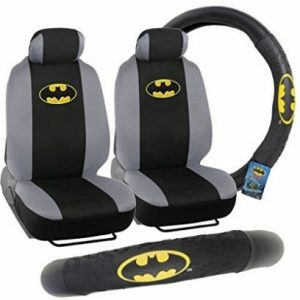 These seat covers Fits most cars, trucks and SUVs bucket seats with removable headrest. 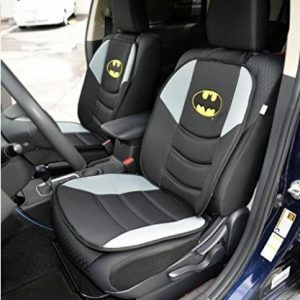 Non-fading black and grey polyester fabric with Licensed Batman embroidered patch. Protects car’s upholstery against UV rays, wear, spills and debris. Foam backing for comfort cushion and stretchy fabric on the back for tight fit. Slide in installation with underneath sewn elastic loops and S-hooks. Hand or machine washable, hang to dry. Allow to fully dry before installing. 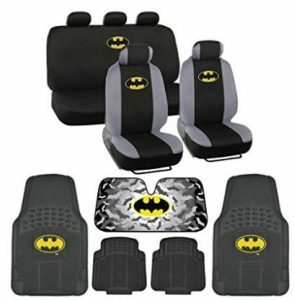 Includes: 2pc front buckets, 2pc bench, 5pc head rests. Get a set of 14 interior protection accessories for around $57.50. 2. 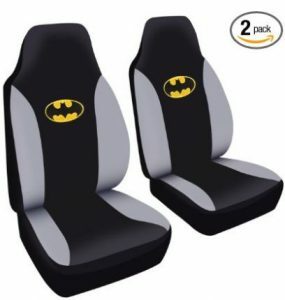 SEATS WITH SIDE AIRBAG. 4. SEATS WITH ARMREST (captain seat). 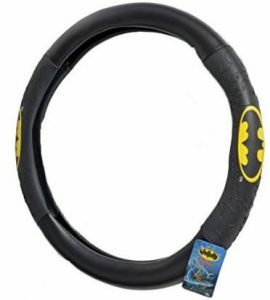 The black batman steering wheel cover is a nice addition to your car interior.